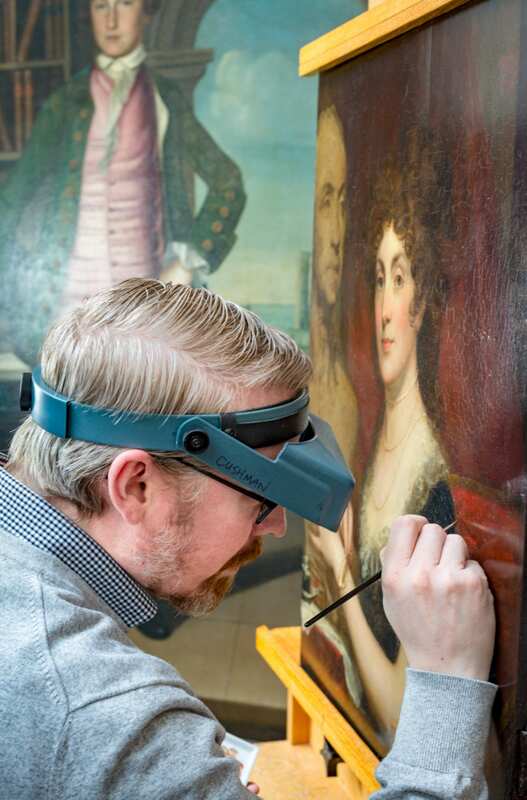 Paintings Conservator Matthew Cushman treating 1963.0077, Portrait of Sarah Wentworth Apthorp Morton by Gilbert Stuart, Gift of Henry Francis du Pont. • Study and assess to add to the understanding of collection objects, achieved through documentation of the current condition, examination of evidence of history and fabrication, and scientific analysis to determine their chemical nature. • Employ Preventive Conservation measures to slow or prevent further deterioration from occurring. This includes providing and monitoring for optimum environmental conditions, providing proper storage with appropriate materials, maintaining the objects on display, and designing appropriate mounts for exhibition. • Treat objects to address structural and aesthetic issues, documenting the process, and utilizing stable, reversible materials. 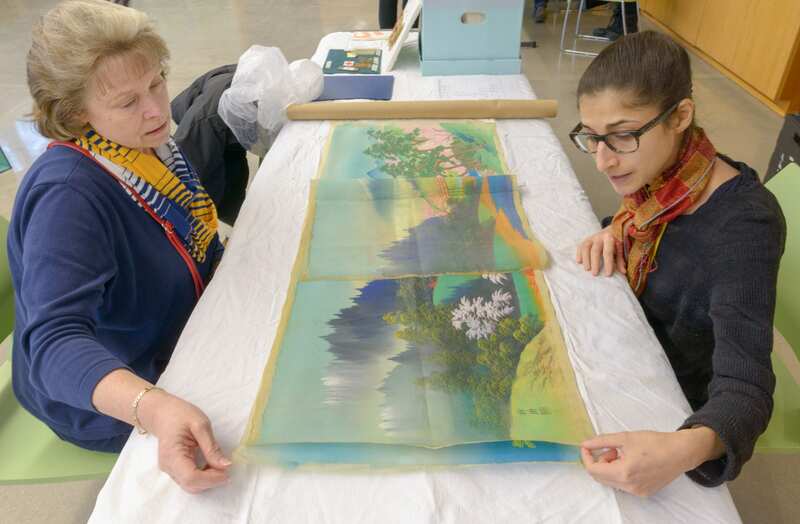 Associate Textile Conservator Laura Mina examines a painted textile during a conservation clinic. • Individuals and groups can schedule a tour of the Conservation Department on the first Wednesday of each month . To reserve a space for you or your group or obtain more information, please call Visitor Services at 800.448.3883, 302.888.4600, or TTY 302.888.4907. • Members of the public can bring their personal objects to a free conservation clinic, offered monthly (September – April), for a condition assessment and recommendations for care. For information or an appointment, please call 302.888.4786. Please note, we cannot offer appraisals or authentications. • Winterthur’s Conservation staff has written a manual for the public to use in caring for their personal collections. This manual provides readers with practical advice on how to care for the objects they value and when to consult with a conservation professional. The Winterthur Guide to Caring for your Collection is available in the Winterthur Bookstore and online. 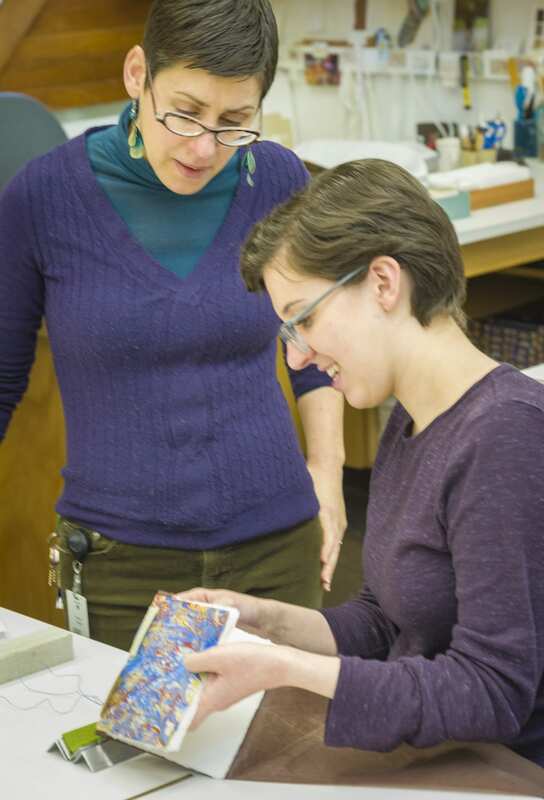 Affiliated Assistant Professor and Associate Library Conservator Dr. Melissa Tedone consults with WUDPAC student Emily Farek. Winterthur is proud to co-sponsor the Art Conservation Master’s Degree Program, one of only five graduate programs in conservation in North America. Conservation work requires a broad background in chemistry, studio art/craft practices, and connoisseurship based in art history and archeology. The Winterthur/University of Delaware Program in Art Conservation (WUDPAC), a three-year master’s degree program, educates and trains future conservators to carry out the examination, analysis, stabilization, and treatment of art, artifacts, and library materials. Graduates of the program work in major cultural institutions throughout the United States and Europe.